We drink a lot of coffee at Viewpoints. And we know that you do too. 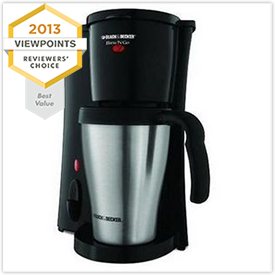 The Viewpoints Reviewers’ Choice awards recognize the top coffee makers on the market, based solely on the product reviews we collect and publish daily on Viewpoints. Our reviews are written by ordinary consumers, not professional testers. 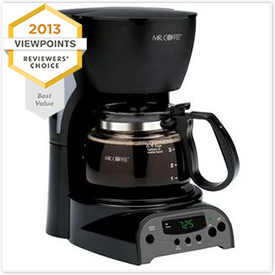 These coffee makers all meet Viewpoints Reviewers’ Choice award eligibility and represent the top 7 percent of 359+ coffee makers reviewed on Viewpoints. The Cuisinart 12-Cup Programmable Coffee Maker is a crowd-pleaser, largely because of its dual purpose. It not only brews fantastic coffee but dispenses hot water. This stand-out coffee maker combines a sleek form with function. Without question, Keurig has perfected single-serve coffee. 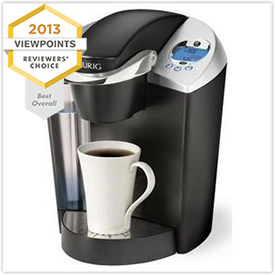 The Keurig Special Edition Brewing System offers 3 cup sizes and accommodates travel mugs. Reviewers talk about being “spoiled.” With so many positive reviews, the people have spoken! Looking for other good deals? You’ll like this page. With the touch of one button, you can brew a hot or iced beverage in under a minute! The machine offers three cup sizes and has an energy saving mode for your convenience. Viewpoints-rated at 94 based on 89+ reviews, reviews consider this “easy and hardworking” machine perfect for making a cup of coffee under 60 seconds. This spill-proof French Press coffee maker has double walls and silicon that act as insulation, to help maintain the temperature of the coffee. The “king of french press coffee makers,” the Bodum Chambord French Press Coffee Maker is Viewpoints-rated at 92 based on 69+ reviews. This industrial-design coffee maker has adjustable temperature control, 24-hour brew programming and the option to pause your brew before it has finished. It’s Viewpoints-rated at 91 with 370+ reviews. This machine delivers fresh blended drinks with the touch of a button. Add coffee and additional ingredients and moments later your frappe drink is ready to consume. 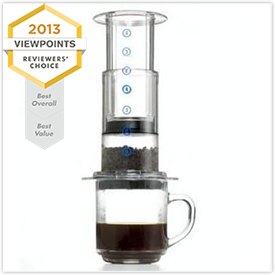 This unique machine is “just as good as the coffee shop” and Viewpoints-rated at 88 with 33+ reviews. This single cup coffee maker uses Keurig technology using K-Cups to prepare your drink under two minutes, at an affordable price point. Reviewers say there’s “no need to buy a name brand Keurig with this machine which is Viewpoints-rated at 88 with 19+ reviews. This 12-cup machine can be programmed to brew a fresh pot up to 24 hours in advance. With a Pause ‘N Serve feature, you can pour yourself a cup without waiting for the whole pot to finish. 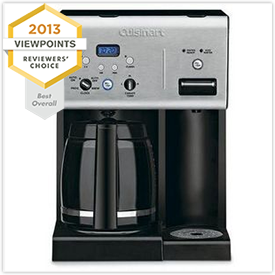 This “dependable” and “stylish” coffee machine is Viewpoints-rated at 87 with 16+ reviews. This classic coffee maker is fully automatic with a 1 to 4 cup setting for days you do not want a full pot. This “reliable, stylish” 12-cup machine is Viewpoints-rated at 86 with 47+ reviews that makes for a good value with “consistently brewed” pot of coffee each time. Editor’s Note: Viewpoints Reviewers’ Choice awards were given in October and November, 2013, and current product ratings may differ.